Figure 1. The scaly, erythematous lesion on the palm. Figure 2. The dystrophic thumbnail. An 8-year-old boy presents with a scaly erythematous lesion on his left palm that has been present for six months (Figure 1). His thumbnail of the same hand became dystrophic four months ago (Figure 2). Fungal infection. On first impression, this palm lesion may resemble tinea mannum, a fungal infection of the hand that has extended to the nail. A patient with tinea mannum may have a history of itch and dryness and may have been in contact with animals or soils or with other people with an active fungal infection (particularly in the case of a child of a parent with tinea). The diagnosis can easily be confirmed through microscopy and culture of a skin scraping, which should be taken from the edge of the lesion because this is where the infection is most active. The most common dermatophyte that would produce this is Trichophyton rubrum. Although tinea occurs in children, it is uncommon. This infection would require an oral systemic antifungal agent such as griseofulvin, itraconazole, fluconazole or terbinafine. Impetigo. This is a localised superficial infection of the epidermis caused by Staphylococcus aureus (or occasionally by Streptococcus pyogenes). It is characterised by an erythematous and erosive lesion, which may blister and crust, but the infection does not produce chronic nail dystrophy. Localised impetigo can be managed with a topical antibiotic such as mupirocin; a more widespread infection may require oral antibiotics. Dermatitis. Dermatitis is characterised by a dry, itchy and erythematous rash. When the palms are involved it is usually bilateral; morphologically, its borders are typically not clearly defined. In a chronic case such as this, it would often be accompanied by features of lichenification and excoriations. An isolated lesion on the palmar surface of the hand would be atypical. Chronic dermatitis involving the fingertips can produce a mild nail dystrophy that causes ridging of the nail plate. Most cases of palmar dermatitis are endogenous, but the possibility of allergens and irritants should be explored. Children are much less likely to be chronically exposed to such substances than adults, but it is worth enquiring about art materials and musical instruments, which may involve more contact with one hand than the other. Dermatitis of the hand responds well to topical corticosteroid therapy and removal of any suspected irritants and allergens. Psoriasis. This is the correct diagnosis. Psoriasis is an autoimmune-mediated inflammatory and hyperproliferative skin disorder in which both genetic and environmental factors play a role. Up to one-third of cases begin in childhood. The morphological appearance of psoriasis in children can be significantly different from the typical appearance in adults. In children, it is less likely to present with well defined red plaques with adherent white scale and the appearance is closer to discoid eczema. The presentation in the boy described above is actually quite similar to that in an adult with psoriasis, but the diagnosis is less likely to be considered because of his young age. It is very common for psoriasis to be mistaken for dermatitis in children – many children suffer from both conditions, which can add confusion to the clinical picture. Biopsy is difficult and not necessary in a child, and in many cases the result may be nonspecific. The diagnosis of psoriasis is a clinical one and may be made once a fungal infection has been excluded. Many forms of psoriasis may mimic a fungal infection in children. However, psoriasis might be suspected for a number of reasons. These include a negative skin scraping from a lesion that is thought to be a fungal infection or a lack of response to antifungal treatment. In addition, psoriasis may be suspected in a lesion that has demonstrated improvement with a potent topical corticosteroid followed by a rebound flare upon cessation of treatment. There may also be other clinical signs of psoriasis present, such as a scaly scalp, plaques on the extensor surfaces of the arms and legs and nail changes consistent with psoriasis such as nail pits and dystrophy (Figure 2). Improvement of the rash in summer is another reason to suspect psoriasis in a child. There is often a family history of psoriasis. For the patient described above, it would be reasonable to assume that the correct diagnosis is psoriasis if fungal and bacterial infection is ruled out by negative skin swabs and scrapings as well as microscopy and culture of nail clippings. Childhood psoriasis can be difficult to manage and referral to a dermatologist is recommended. Several topical preparations used in combination are first-line management to induce remission; many patients also require long-term maintenance therapy. These therapies include topical corticosteroids (with or without calcipotriol), topical coal tar (with or without salicylic acid) and dithranol. UVB phototherapy is also sometimes required in children with psoriasis that is resistant to treatment. In very severe cases of psoriasis, systemic medications are used in treatment – these include acitretin, methotrexate and etanercept, a TNFα inhibitor that is approved in Australia for use in children. Fortunately, psoriasis of such severity is not commonly encountered in children. 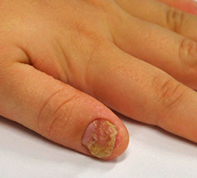 Nail disease: is it fungal and how should it be managed?